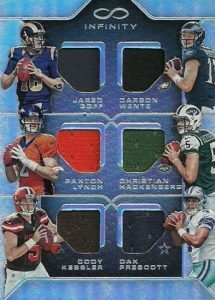 One of several new brands to fill out their NFL exclusive, 2016 Panini Infinity Football is a hit-focused product with rarity in mind. Every hobby box contains three hits. 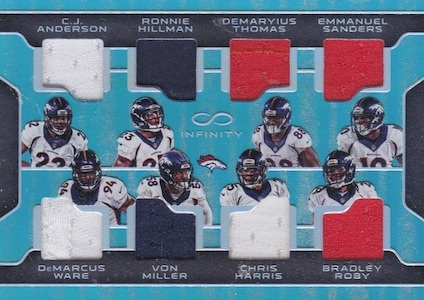 The 2016 Panini Infinity Football base set is anything but infinite with a print run of just 88 copies. 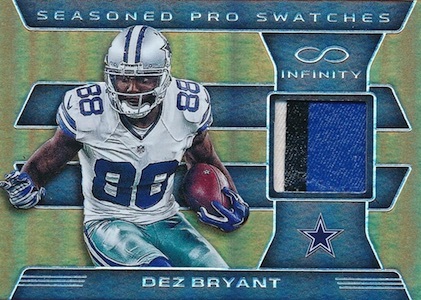 This includes subsets for Rookies and Legends in addition to the regular base cards. Unique (#/8) and Rare (1/1) parallels provide even more rarity. 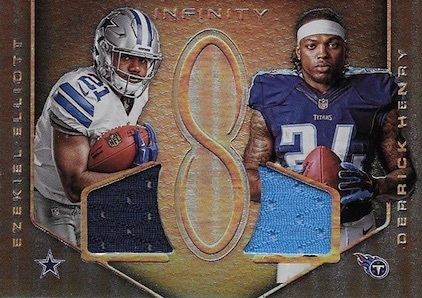 Split between the biggest NFL names and the most notable incoming rookies, 2016 Panini Infinity Football features multiple autographs and relics. Locker Room Legends Autographs works with ten Super Bowl-winning quarterbacks through cards limited to their jersey number. 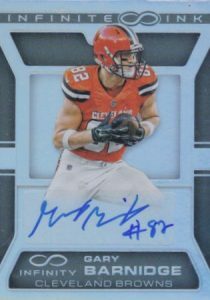 RPS Rookie Autographs showcases the 2016 NFL Draft class with Chrome, Gold and Copper versions. There are also RPS Rookie Materials that contain relics for individual players as well as many as six different rookies on the same card. Among the rarest options in the release, collectors can find the one-of-one Super Prime parallel for each card. 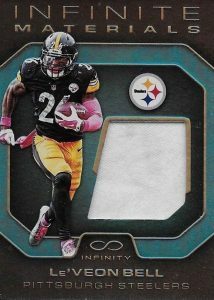 Although hits are the clear focus in 2016 Panini Infinity Football, inserts are not left out and center on current players. Infinite Potential honors ten of the most exciting rookies while No Limits includes ten young stars. No, it's not a misspelling. Short print NFINITE inserts don't have time for the first letter of the word. These rare cards drop 1:2 cases and feature 12 key subjects. 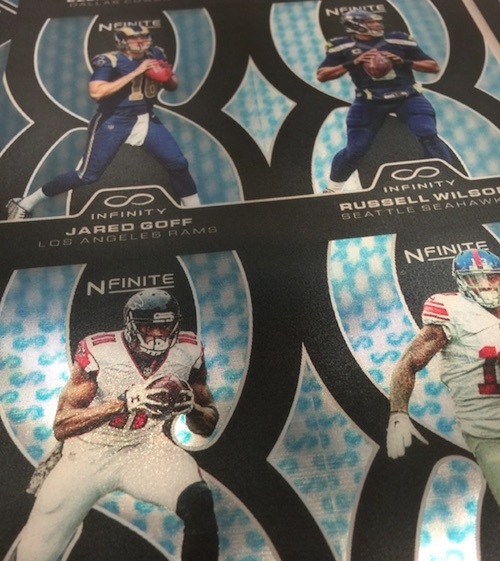 UPDATE: Panini has announced that the NFINITE inserts will be even more rare that initially solicited. They will now average 1:5 cases. 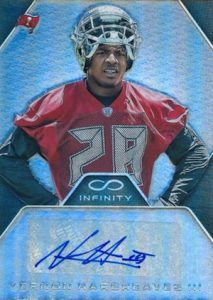 2016 Panini Infinity Kenneth Dixon AUTO RC, SP # 288, Ravens Rookie! PARALLEL CARDS: Common #/88, Unique #/8, Rare 1/1. 40 cards. Serial Numbered #/288. PARALLEL CARDS: Gold #/8, Copper 1/1. 8 cards. Serial Numbered #/88. PARALLEL CARDS: Gold #/8, Red 1/1. 30 cards. Serial Numbered #/88 or as noted. 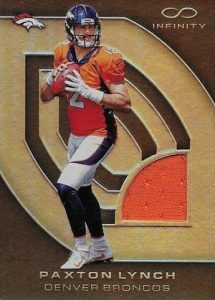 PARALLEL CARDS: Prime #/8 (*Card #10 - #/6), Super Prime 1/1. *Card #12 not included in Prime Parallel. 40 cards. 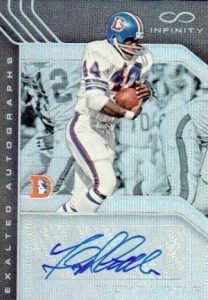 Serial Numbered #/88. 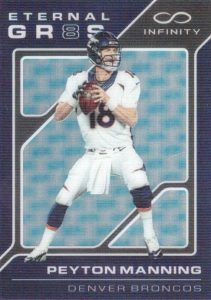 PARALLEL CARDS: Prime #/8, Super Prime 1/1. 25 cards. Serial Numbered #/88. *Card #10 not included in parallels. 20 cards. Serial Numbered #/288. 10 cards. Serial Numbered #/88. 5 cards. Serial Numbered #/88. 3 cards. Serial Numbered #/88. Another product push by money hungry Panini. STOP putting this garbage out there! Why is it garbage? You know it’s a business right? I opened three boxes of this. All three had only one auto. Two of the three had some low numbered patches. Card designs just so-so – I like Origins so much more than this. Cheap enough to maybe sell, but nothing worth COLLECTING here. Sure, it is a BUSINESS but it stemmed from a HOBBY. Actually between 2 and 3. Sooooo many no name rookie autos in the case I participated in. Lots of redemptions also. About 6, I believe. Base card is not very attractive. There were about 5 big hits. Wentz auto, Kessler auto, Braxton Miller Auto. Gurley redemption auto…No cards #/8. 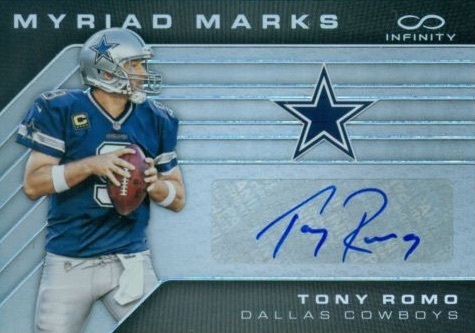 Most of autos #/288, 388, even 488. ALL relics were single color. No patches. But, low end product so…there it is. Oh..1 Infinity card of Tom Brady…huge SSP. Maybe this case was not representative….Think I’ll move along to the other products like Origins and Spectra. 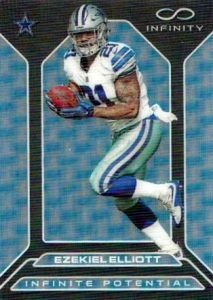 Panini putting out garbage again! Cracked a case and 95% of the packs had 1 auto /288 or higher. And the patches are all one color! There is nothing special with product. Lots of unknown rookies too. After 6 solid years of buying at least 1 box (usually 2 or 3) of every mid to high level product, I’m done collecting. Panini has ruined it. 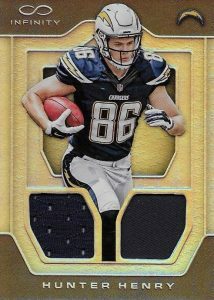 Any idea when Topps can get back into NFL licensed products? Bought 3 boxes and on the 4th I pulled the Carson Wentz auto 1/1! So yeah you can say I like Infinity! Pulled the Wentz auto 1/1 about a month ago. So yeah you can say I like the infinity! 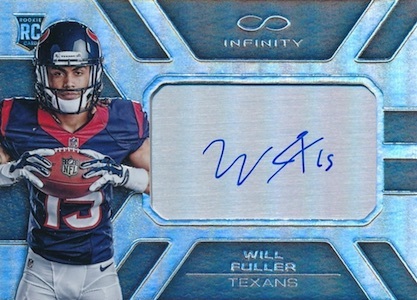 Probably would not be writing if got a major hit but my auto was a 6th rounder that didn’t even make the team. For such a premium price I really don’t think its ethical to include rounds 4-6 on autos. Tom Brady was Halley’s comet. Let’s not pretend these 6th rounders ever produce and cut them out of premium products. My son and I have ripped a good amount of this. Really like it, we got 1/1 Joe Montana Retired Numbers and 1/1 Peyton Manning Retired Numbers as well as a good number of Goff and Wentz autos! I think it is all and all a great product,almost have the common /88 set complete need one more card,me and my child have had alot of fun putting it together.